A Miami police officer has been suspended with pay after a Miami resident filmed him kicking a man who was already in handcuffs in the head. 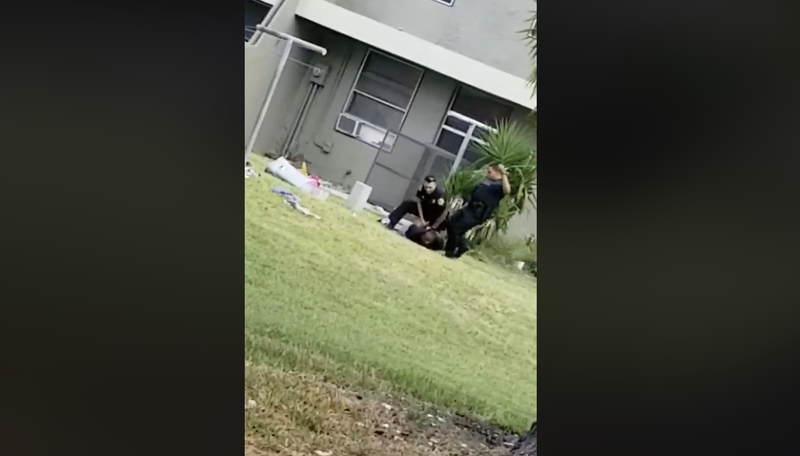 The incident, video of which was posted on Facebook, took place at the Culmer Place Apartments in Miami’s Overtown neighborhood. The officer, identified as Mario Figueroa, is a two-year veteran with the department. The video was captured by Lisa Harrell, a woman who lives in the apartment complex, and according to the Miami Herald, she immediately posted the video on Facebook. The Miami Police Department identified the man being arrested as David Vladim, who authorities say was fleeing after being caught in a stolen car. In the video, you can see that Vladim is already down on the ground and handcuffed when Figueroa runs up and kicks him in the head. Of course, the arrest report filed never mentioned that the officer had kicked Vladim in the head. In a statement, Miami Police Chief Jorge Colina said that Figueroa’s action “depicts a clear violation of policy,” and Miami-Dade State Attorney Katherine Fernandez Rundle has ordered an investigation into the incident.